With the start of the NHL Season just around the corner the MATA is happy to Profile Rob Milette the Head Athletic Therapist for the Winnipeg Jets as our October 2015 AT of the Month. Rob Milette is entering his fifth season with the Winnipeg Jets Hockey Club as the Head Athletic Therapist. Milette also worked as head therapist for Team Canada who won a gold medal at the 2015 IIHF World Championship in Prague, Czech Republic. Milette spent nine seasons with the Manitoba Moose, six of those years in the Head Athletic Therapist role. 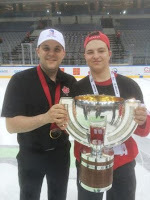 Prior to his time with the Moose, Milette was the Therapist and Equipment Manager for the University of Manitoba Bison men's hockey team for two seasons. He was also an Assistant Trainer with the Winnipeg Goldeyes during the 2000 season. "Mullet" is a member of the Canadian Athletic Therapists Association and received a Bachelor of Exercise and Sports Science (Athletic Therapy) degree at the University of Manitoba. Milette and his wife Camille, have two children, Bauer and Janelle and live in Saint Adolphe, MB. The reason I chose to become an athletic therapist was that I had a strong connection to sports, particularly hockey. Since I was not an elite level athlete I needed to find another way that I could get into this business and make my mark. Athletic therapy seemed to be an excellent fit. I would definitely say that I had a few excellent role models in my career. From the start of my university studies Jackie Elliott has been a great role model, instructor and friend. She was a huge part of my development and gave me the drive to succeed in this profession. In my professional hockey career I would have to say that Mike Burnstein, 20 year NHL athletic therapist, was the main reason that I got my start as a head therapist in professional hockey. He helped me understand the job complexity and the commitment required to be a great professional. Last but certainly not least Craig Heisinger who is currently an assistant general manager with the Winnipeg Jets, he gave me my start in the business and allowed me to take the reigns as Head Athletic Therapist first in the AHL and now with the NHL. I thank him for all the guidance and belief that I could succeed as an athletic therapist. I chose to work with professional athlete's because there are no better patients in the world, everyone of these guys has great drive and physical condoning, allowing them to return to play quickly and safely. One of my career highlights would definitely be when I was named Head Athletic Therapist for the Winnipeg Jets, being able to work in the best hockey league in the world as well as living in your home town is a dream come true. Secondly, proudly representing my country with Team Canada at the 2015 IIHF World hockey championships, not to mention coming home with some beautiful gold hardware around my neck. Some advice I would offer to a young therapist trying to pursue this career path would be to get as many tools in your tool box as possible. Separate yourself from the rest, learn how to sharpen skates, learn the equipment side of the game, if you prefer the strength and conditioning side focus on that. Do what ever you can to push yourself to the head of the pack.